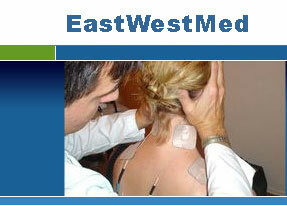 The modalities may be combined and sequenced for innovative and effective treatment protocols. Many such protocols are pre-set and may be set up with the touch of a button. Microcurrent (�A): A level of electrical currents that in the millionth of an ampere range. Therapeutic microcurrent stimulation is generally at a level several hundred to a thousand times less intense than conventional milliamp electro-stimulators. Probes: Special electrodes used to treat specific points on the body, such as trigger and acu-points, with microcurrent stimulation. 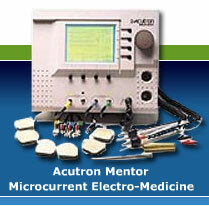 The Acutron Mentor probes also measure skin impedance, thus confirming optimal electrical conductivity and placement. Trigger points: Focus areas of hypersensitivity on the body surface. Trigger points are often related to chronic injuries and internal health problems. Interferential (IF): A form of electrostimulation that utilized four electrodes surrounding the part of the body to be treated, with each set of two electrodes at a frequency out-of-phase with the other set. Used for treatment of large and broad regions of the body. The Acutron Mentor offers 6 different pre-set interferential treatment set-ups, some in the microcurrent range and some classic milliamp IF. 'Classic' IF refers to the original high-intensity form of interferential current developed in Germany in the 1960's by Hans Nemec. Milliamp (mA): A level of electrical currents that in the thousandth of an ampere range. Used in most conventional electro-stimulation devices such as TENS, classic interferential, muscle stimulation and high-volt galvanic. The Acutron Mentor offers many pre-set milliamp treatments, generally used for acute conditions. Russian stimulation: A specific form of electro-stimulation with a polyphasic waveform produced by dividing a 2500 Hz carrier frequency into 50 Hz packets. Originally developed by the Russian Olympic team for muscle mass enhancement, now often used for pain control in the United States. Preset treatment protocols: A feature of the Acutron Mentor that allows complex treatment protocols to be set-up easily with the touch of a button. Each preset specifies some or all of the following electrical parameters: Current Intensity Frequency (Hz) Waveform Modulation Polarity Timer Pulse duration The presets can be used as is, or may be modified as desired by the practitioner. 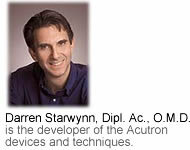 The Acutron Mentor allows for creation of up to 21 new custom presets in addition to those set by the factory. Probes, Microamp pads, Milliamp pads, Interferential. Impedance: Drag on an electrical circuit, also called resistance. Frequency (Hz) Range: 0.1 - 1000 Hz. 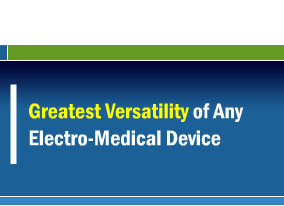 Direct galvanic current also available. Special frequency ranges offered for classic interferential (4000 - 4250 Hz) and Russian stimulation (2500 Hz). Polarities: Positive, negative, biphasic. Polarity change time adjustable. Color coding on leads and LED indicators on probes clearly show polarity of each electrode for proper placements. Waveforms: Square, slope, modified square, and sawtooth in microcurrent range, and pulse and sine waveforms in milliamp range. Dense-Disperse: Hz rate alternates between a high and low value for analgesic effects. Ramp Hz: Gradually increases and decreases frequency over adjustable cycles. For applying a wide range of therapeutic frequencies automatically. Two-step sequence treatments: The Acutron Mentor offers several preset treatments that sequence two different treatment protocols in a single session. For example, preset IF #5 starts with classic, high intensity interferential current for the first 5 minutes, then switches over to gentle microcurrent interferential. Meter Monitor System: These are used for locating and selecting optimally conductive points and areas for therapeutic stimulation on the subject's body in Test Mode, and they also confirm treatment current levels in Treat Mode. Audible tones rise and fall with fluctuations of meters, and follow the most recent output channel used.